Baby, it’s cold outside and while the holiday spirit makes me warm and bright, it was the vision of steaming hot buttered rum that kept me trekking through the tree farm in search of the perfect Christmas tree. From the moment we tied the big, busy tree to the top of the car and began the drive home, I could smell the cinnamon and nutmeg and practically taste the creamy rum. Hot buttered rum—the perfect drink for our tree decorating party later in the evening. 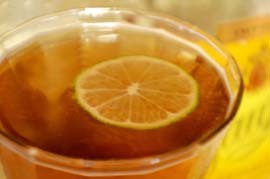 There are lots of recipes for hot buttered rum—one of the earliest appeared in The Ideal Bartender in 1917—but mine is beyond wonderful! 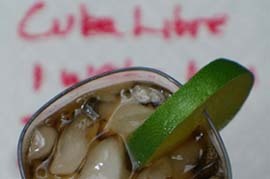 It comes from my friend, Pete Woll, known throughout French Gulch for the best hot buttered rums. The treat is traditionally made from a simple butter batter, aged dark rum and boiling water, but Pete’s combines best-quality vanilla ice cream, butter (not margarine), brown sugar, cinnamon and nutmeg for an extra rich, fragrant indulgence. 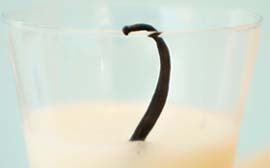 Each winter, I whip up a large batch of the batter and freeze it to make quick drinks throughout the season. 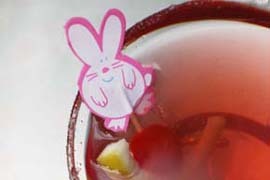 This drink is a wonderful Christmas memory from my childhood when Dad made a non-alcoholic version for my brother and me. Today, all our kids love theirs in Santa mugs with a dollop of softened ice cream and a sprinkling of cinnamon and nutmeg. 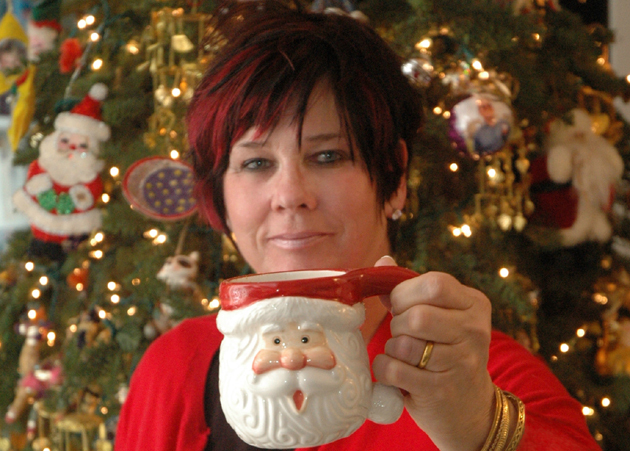 As family and friends gathered to decorate the tree with treasured ornaments collected over the years, I felt the magic of the season, and realized that while I’m now old enough for rum, I still thrill at drinking from my Santa mug. Print a copy of Hot Buttered Rum for your convenience. 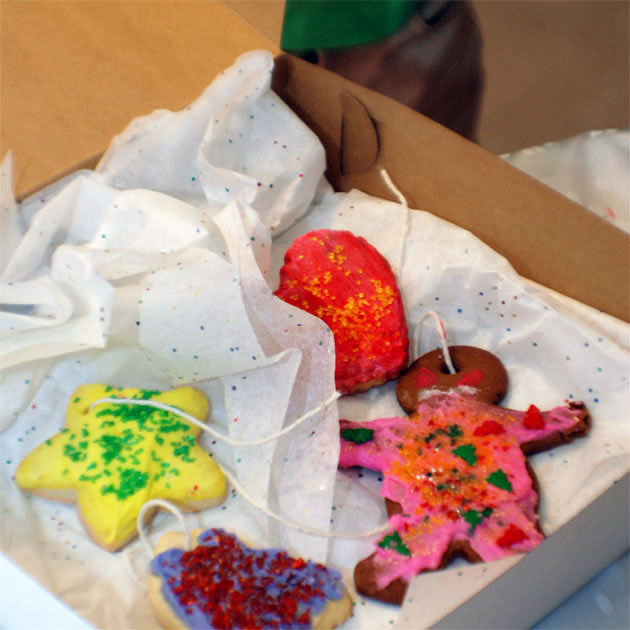 Sprinkle the kitchen liberally with fairy dust, crank up the rockin’ holiday music and they will come. Lots of them. 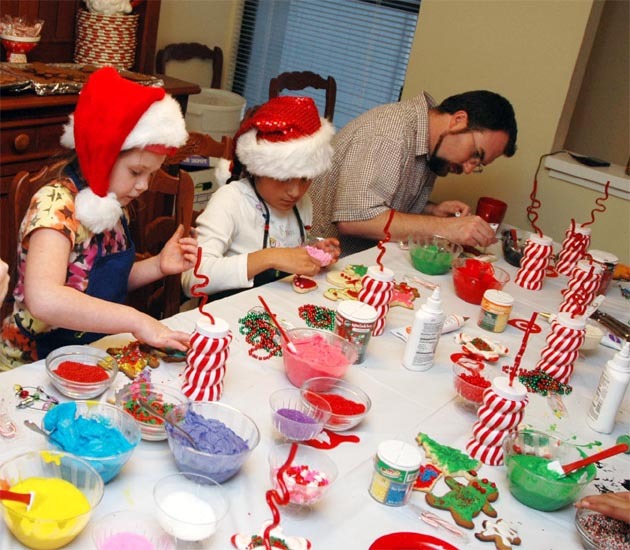 Every year tiny Christmas elves turn my kitchen into Santa’s workshop as they decorate dozens of holiday sugar cookies and gingerbread people. 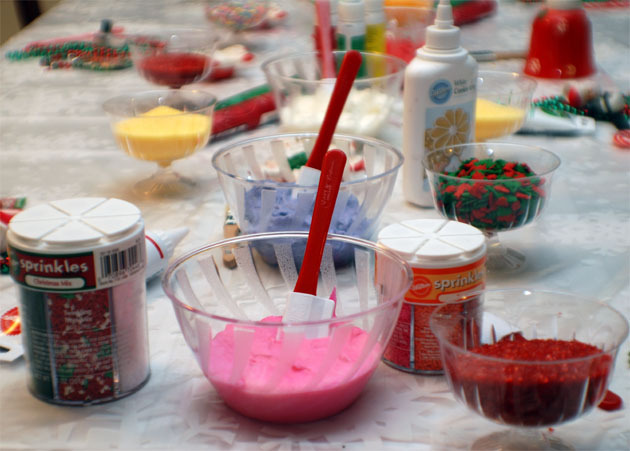 Eyes wide-bright, they ooh and ahh at the site of my long kitchen table laden with yummy pots of brightly colored buttercream frosting, sprinkles, edible glitter, red hearts and whimsical decorations. Their eyes dart to the sideboard where large trays of delicious cookies wait for their magic. 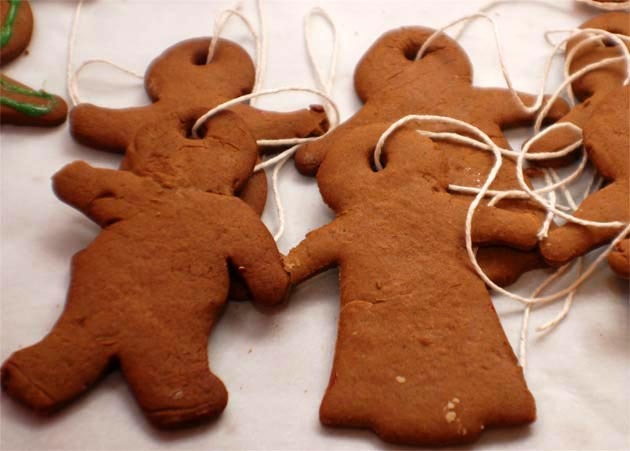 Soon little hands eagerly collect favorite angels, stars, trees, bells and gingerbread mamas, daddies and babies. As head elf, I pile on the holiday spirit with Santa hats, aprons and festive party favors. 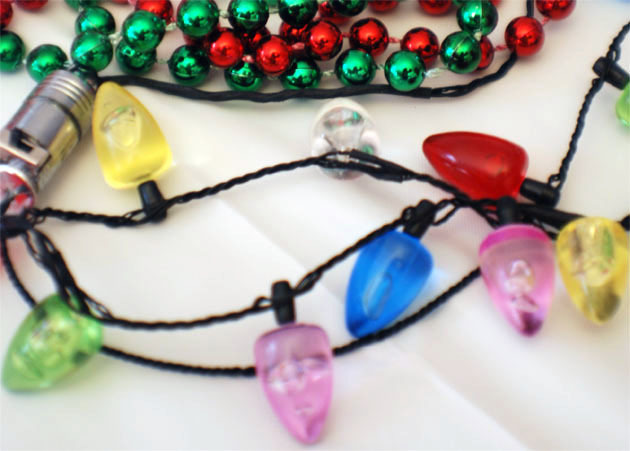 Nothing breaks the ice like blinking necklaces of colored lights and silly, flashing Rudolf noses to remind kids of their friends at the North Pole. 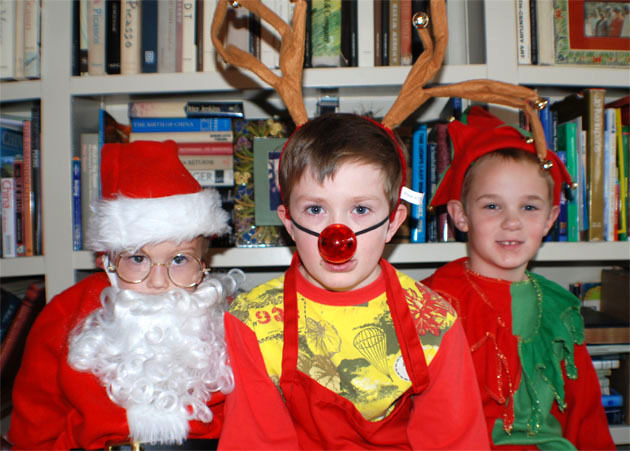 These little guys get into the party spirit as Santa, Rudolph and Jango the elf. Look at that black tongue! 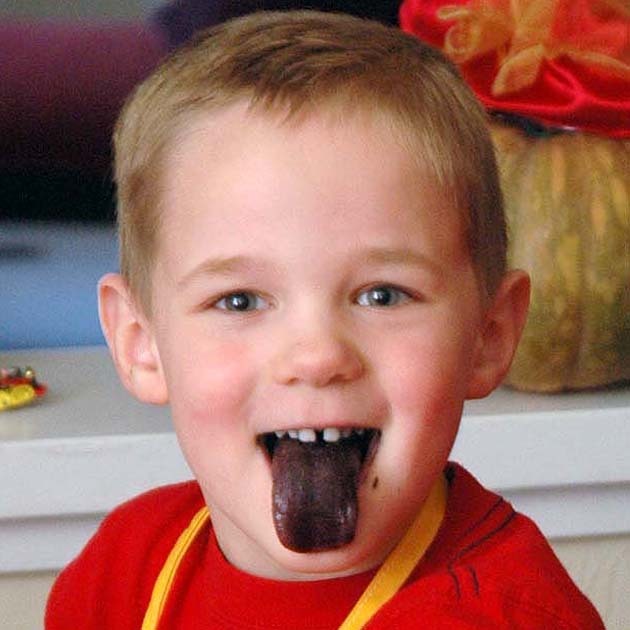 This cutie-pie swiped his mini spatula in the black frosting and immediately started eating it. In a flash all the boys joined in, giggling and showing their black tongues to the other kids. Soon all the guests—young and old—got in on the silly fun. The joy of creativity is infectious. Each year I get a special thrill when the kids tire of the cookies and run off to play, only to be replaced by their moms and dads, eager for a shot at the frosting. My oldest guest (85 years young!) hung three masterpieces on the kitchen cookie tree. Beyond Wonderful intern Theo Andersen is my very cool Santa. 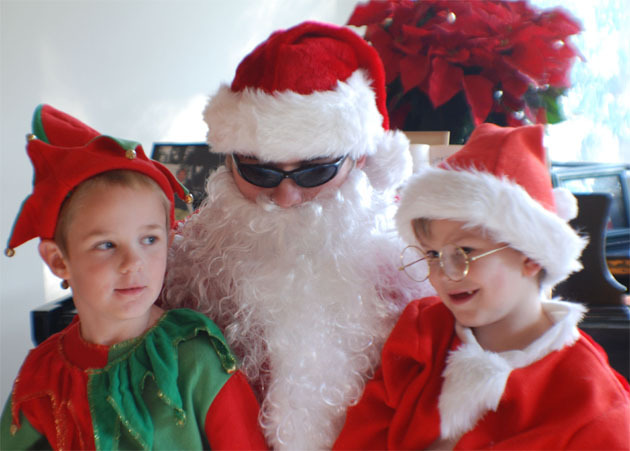 Dressed in a full Santa suit, he always bursts into the room with a robust, “Ho-ho-ho—Merry Christmas!” He listens to each child’s wish and distributes candy canes to all. 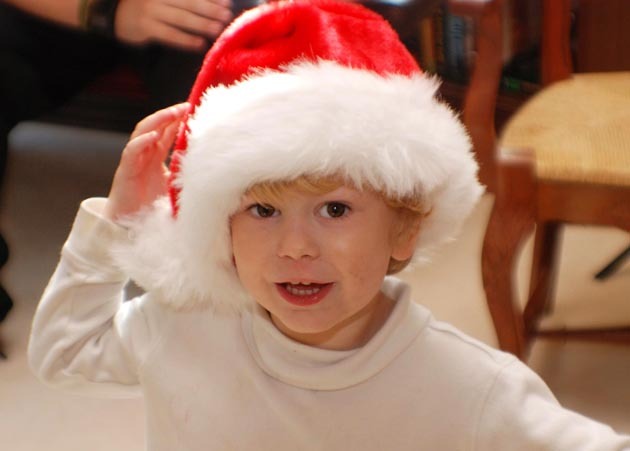 This Santa is always hungry and happily accepts cookies! 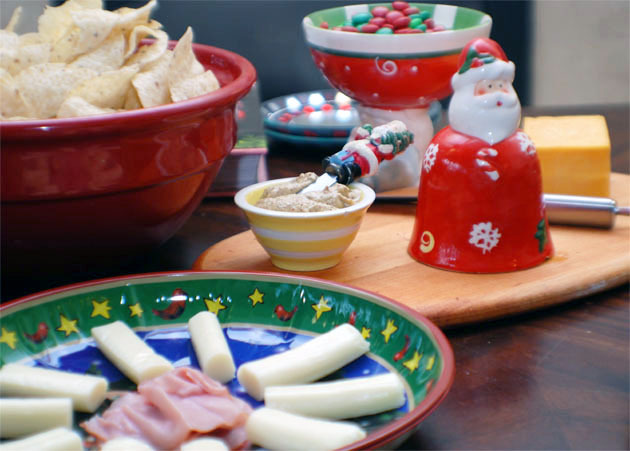 To keep the elf energy up and prevent a sugar overdose, I set out lots of tasty savory snacks on a low table for easy access. Deli meats like salami and ham are always popular. 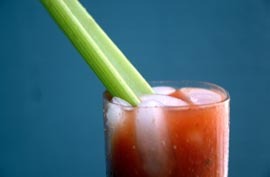 Add some cheese, bread and crackers with fresh fruit and veggies, a few drinks and you’re set. After a few hours, the elves of all ages are ready to carry their cookie treasures home. I find that inexpensive, different-sized cardboard gift boxes with tissue paper do the job well. Close each with a festive sticker to make it feel special. I am reminded, as always, that kids are magic—especially when surrounded by so much sugar and creativity. 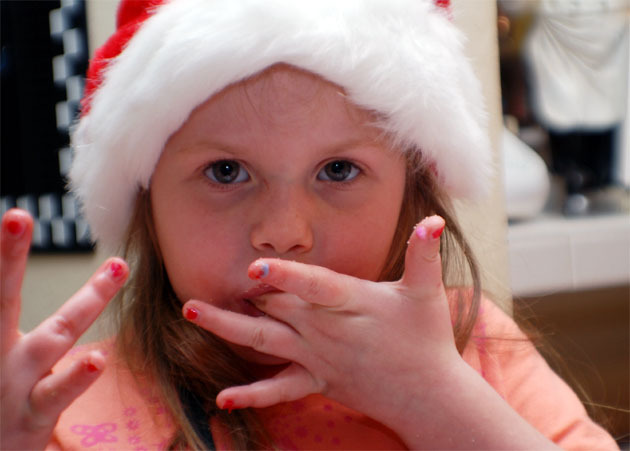 Take your cue from them, and your own cookie party is sure to be sweet success. 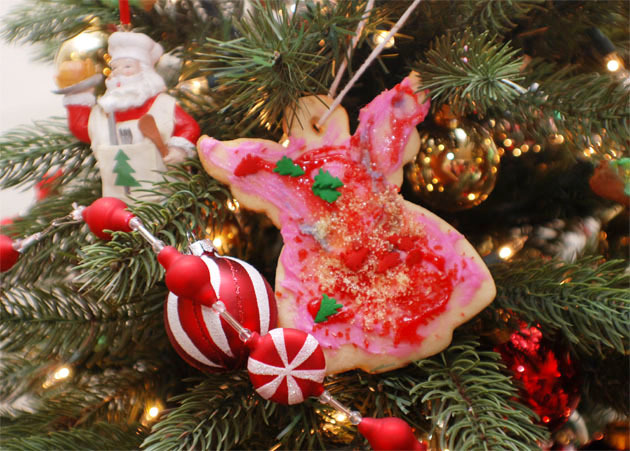 Get printable copies of Sugar Cookies and Gingerbread Cookies for easy reference. 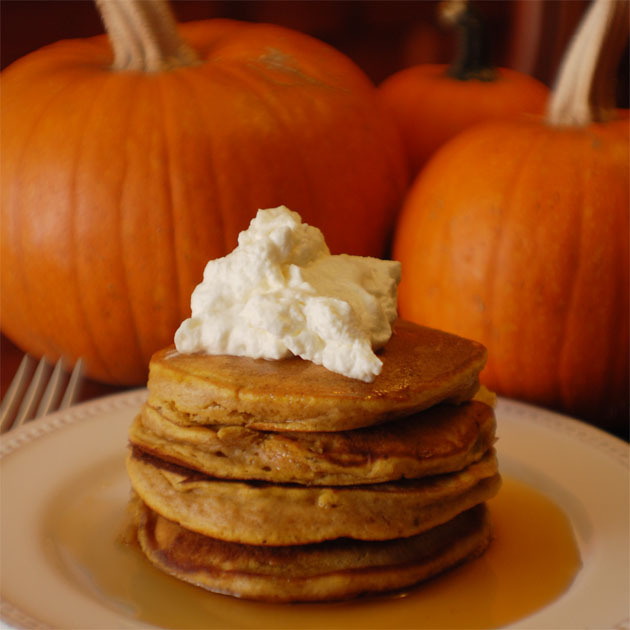 Grab your hammers and cleavers, we’re roasting pumpkins for holiday pies, cakes, breads—and the most scrumptious pumpkin pancakes around. So are you up for roasting pumpkins? “No, no, no, no”, you say. “That’s not for me.” As a novice cook, I felt the same way. Pumpkins came in a can from the supermarket for the express purpose of making pies once a year. Who knew that fresh pumpkins were easy to use—and suitable for so many dishes? 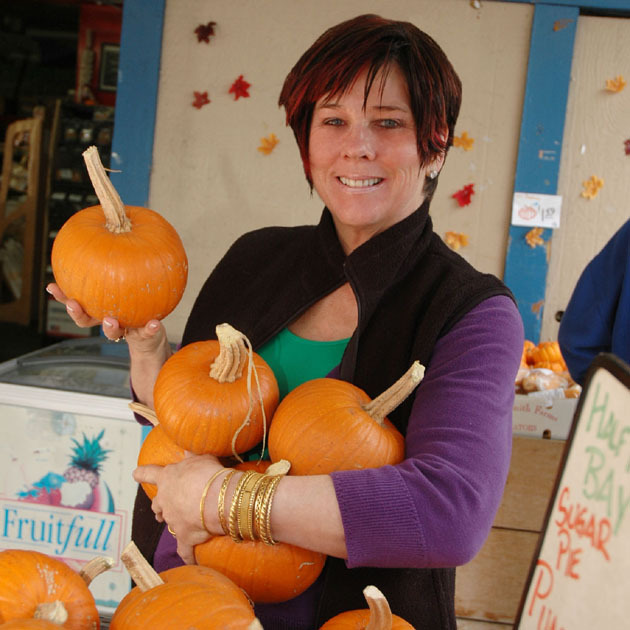 My friend and produce expert, Dan Avakian, encouraged me to start roasting my own pumpkins then taught me how. It was painless from the start, and now it’s so easy that I can roast and freeze a year’s supply in one afternoon. Today, my kitchen counter is filled with edible pumpkins that I bought at Dan’s open-air produce market last Saturday. I stocked up on my favorite, orange Sugar Pie variety. Dan showed me other possibilities like the Green Fairytale, Cinderella, Australian Queensland Blue (aka Jarradale) and Lumina whites. With so many choices, I had lots of questions and felt lucky that someone as knowledgeable as Dan was there to answer them. It reminded me that you should always get to know your local produce people and fearlessly ask them anything on your mind. Not only will they guide you to your best options and values, but they’ll also suggest new ideas that will enhance your menus. The one thing about roasting pumpkins that most people don’t know is that you cannot eat the decorative varieties grown for Halloween jack o’ lanterns. If you have some uncut ones left over, use them as autumn decorations. Let’s get to work. The pumpkin roasting process takes a few hours of prepping, baking and pureeing—so if I’m doing a large batch, I set up an assembly line to move things along efficiently. Of course if you’re just doing one pumpkin it’s all even easier. 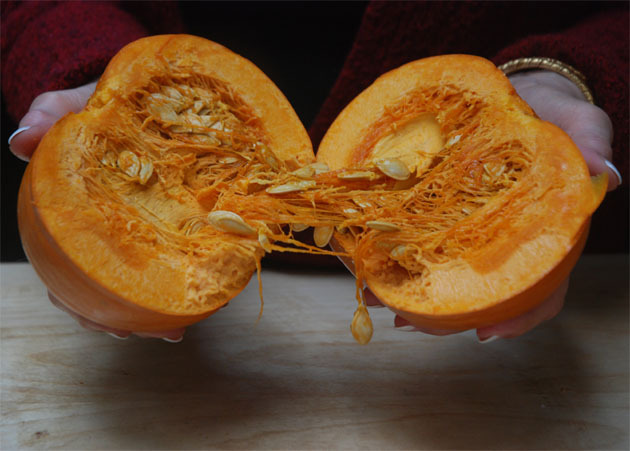 Either way, it’s great fun to knock off the pumpkin stem with a hammer, split it with one good whack of a cleaver and scoop out slimy pumpkin goop and seeds with your hands. 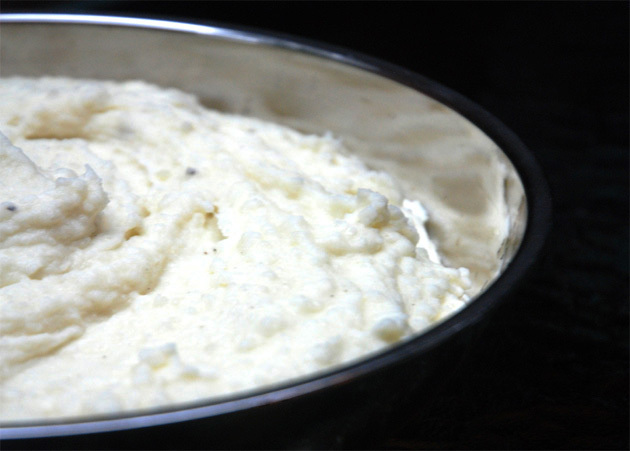 Your reward is a deeply flavorful and marvelously textured product that beats anything in a supermarket can. 2. Remove the pumpkin stem by giving it a good whack with a hammer. 3. 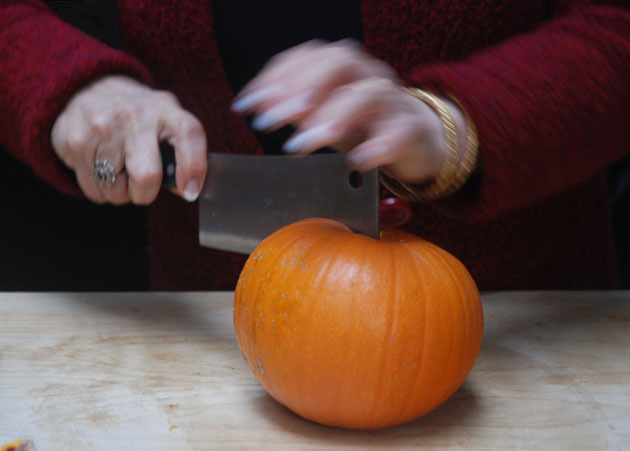 Cut the pumpkin in half—top to bottom—using a sharp cleaver or chef’s knife. NOTE: Never use a dull or thin knife or you may cut yourself or break the knife. 4. Pull the sides of the pumpkin apart. 5. 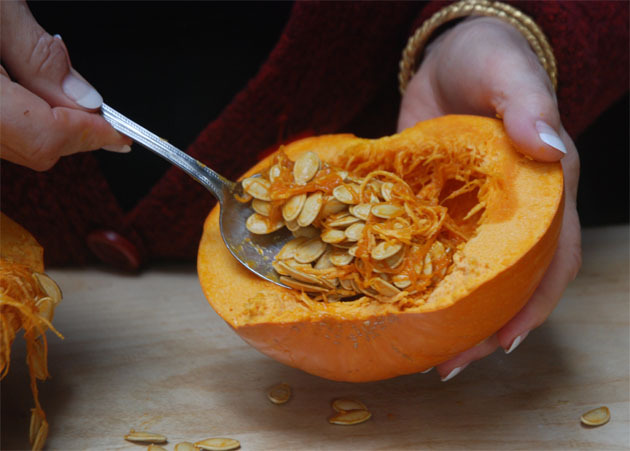 Scoop out the stringy pumpkin goop and seeds with a large spoon or your clean hands. Save the seeds for roasting. 6. 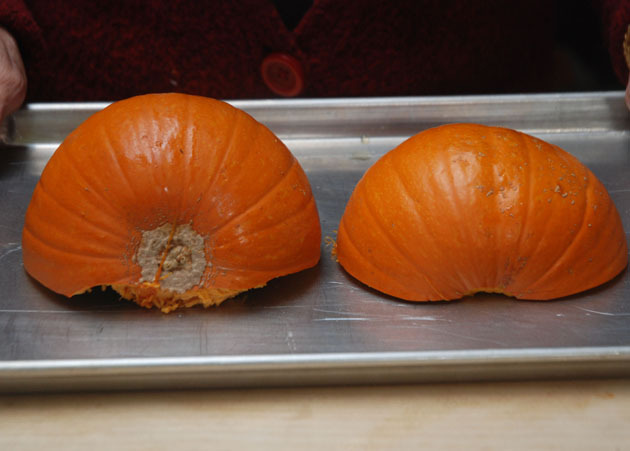 Place the pumpkin halves—cavity side down—on a baking sheet. Bake in the preheated oven for 45 minutes. 7. Remove the pumpkins from the oven and turn them over—cavity side up. Reduce the heat to 350 degrees and bake an additional 15–30 minutes, or until a fork goes through the flesh easily. 8. Remove the pumpkin halves from the oven and let them cool for one hour. 9. 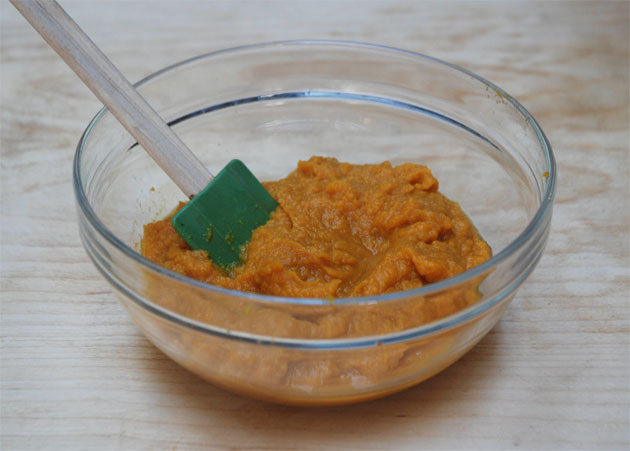 Puree the pumpkin using a food mill, food processor, blender or immersion blender. 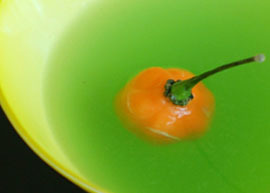 Add a few tablespoons of water to the pumpkin get the process going. 10. 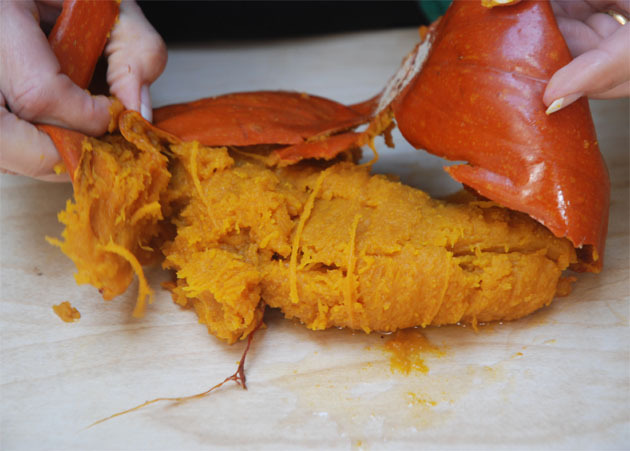 Store the pumpkin puree in the refrigerator for several days or freeze it in airtight zip-top bags. 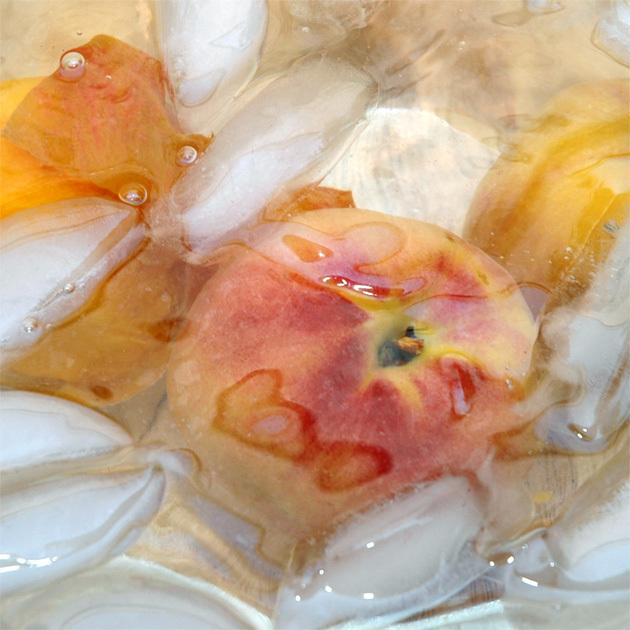 Be sure to lay the freezer bags on a cookie sheet when freezing so that they will remain flat and easy to handle. Otherwise you’ll end up struggling to pry bags off of your freezer shelf. Print out my illustrated step-by-step How To Roast Pumpkins and recipe for Pumpkin Pancakes for easy reference. Trips to the farmers market always yield a treasure or two that aren’t on my shopping list. So when a vendor approached with a large sample platter of sliced, golden peaches I couldn’t resist. They were perfectly ripe, packed with flavor and dripping juice. Pie! They would make an amazing fresh peach pie. 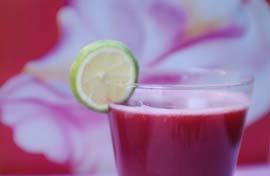 I savored a second sample and started creating the recipe in my head. 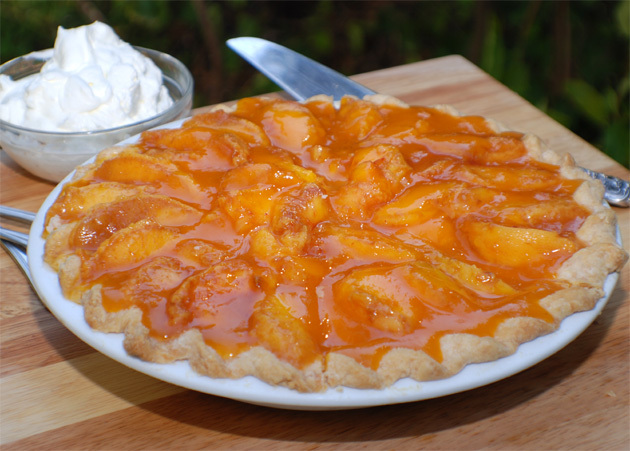 This pie would be stacked high with glazed, sliced peaches in a basic pre-baked crust. Fruit this good is best showcased with a simple glaze made from peaches, sugar and water and thickened with cornstarch. No need for a lot of spice here—let the pure peach flavor shine. And the topping—clouds of whipped sweet cream generously spooned on each slice. Perfection! Making my way through the crowds to the peach stand, I was disappointed to see that not all of the fruit was as ripe as the samples. Maybe this pie wasn’t going to happen anytime soon. Since I was going to need 10 to 12 medium-large peaches for both the glaze and filling, I asked the salesperson for help. She set about selecting the best fruit for today’s project. “We’ve sold a lot of peaches today and had to put out a new batch—some are less ripe.” After checking her reserves, she found what I needed and rang them up. I thanked her and headed home to start the pie. 1. 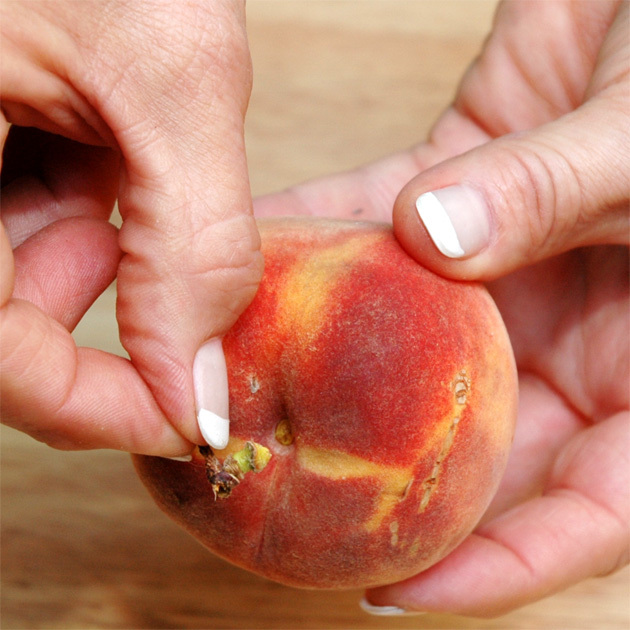 Remove the peach stem with your fingers. 2. Cut an “X” into the bottom of the fruit. 3. 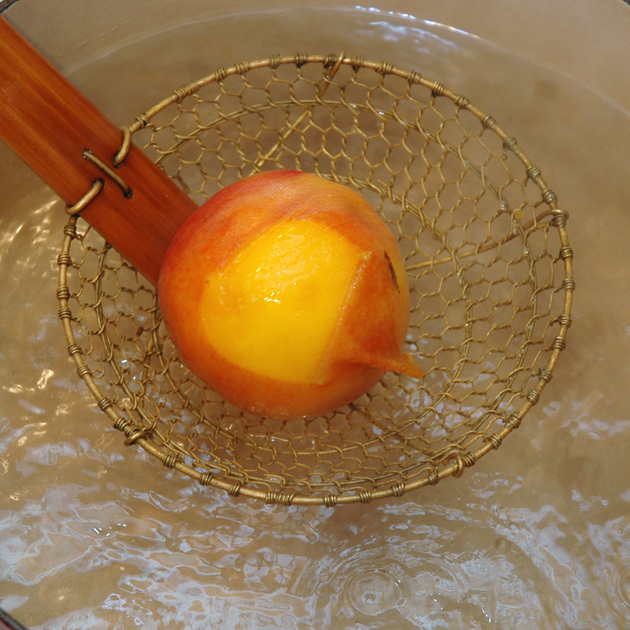 Submerge the peach in a pan of boiling water for 10 to 30 seconds. They are ready when the skin around the “X” begins to curl. 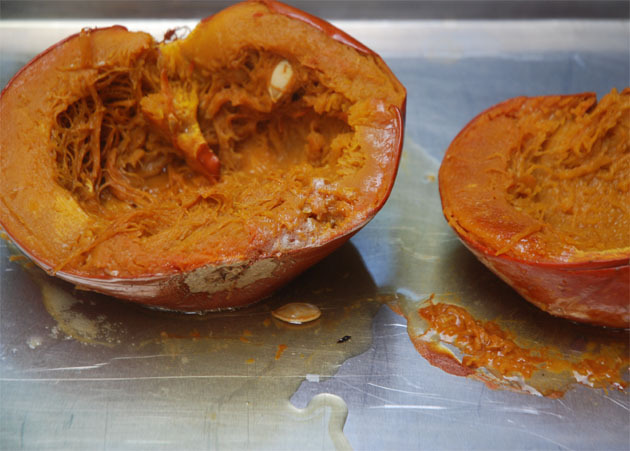 A ripe fruit peels more quickly than an under-ripe one. 4. 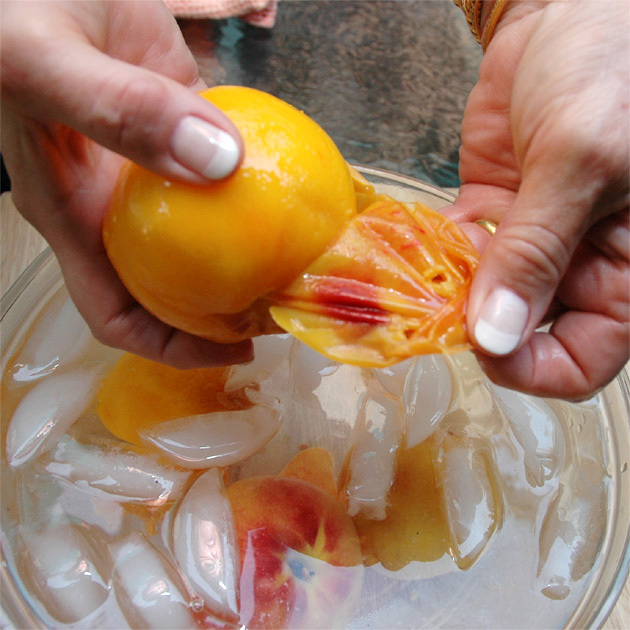 Remove the peach with a slotted spoon and place it in a bowl of ice water to stop the cooking and loosen the skin. 5. Slip the skin off with your fingers or a paring knife. 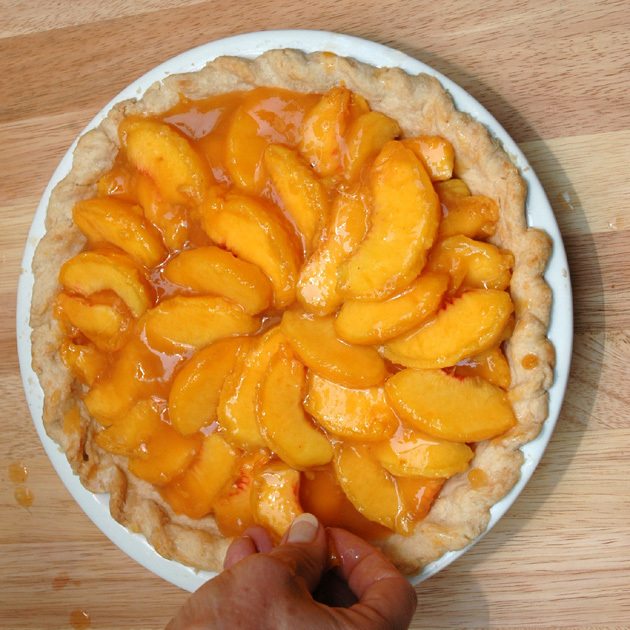 Peeling and slicing the peaches for this luscious pie is a quick process. And it’s especially satisfying to breathe in their intoxicating scent that soon permeates the kitchen as you work. Assembling the pie is a breeze. 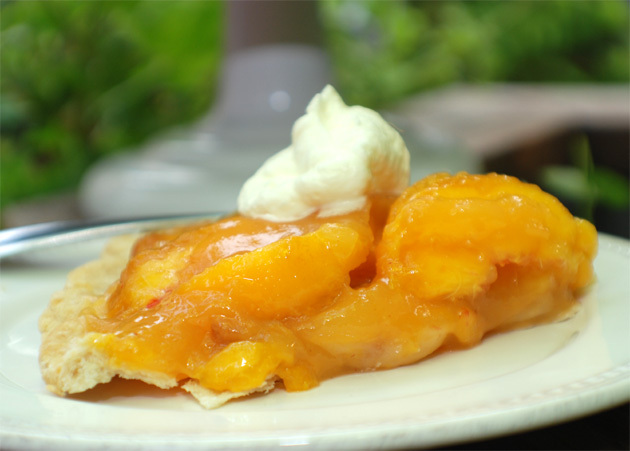 Have your peach glaze and pre-baked crust ready and then build the pie in layers. I like arranging the peach slices in a pretty circular design, and then slathering it was a generous coating of the glaze before starting the next layer. My biggest problem is not eating the peaches while I work. It’s utterly hopeless—all those juicy bits and pieces of fruit just waiting to be plucked from the bowl. Who can resist? Once the pie is finished and chilled through, I top each slice with a dollop of freshly whipped cream. Here have a piece. 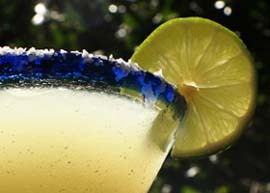 Close your eyes and savor the moment: this is the essence of great summer eating. 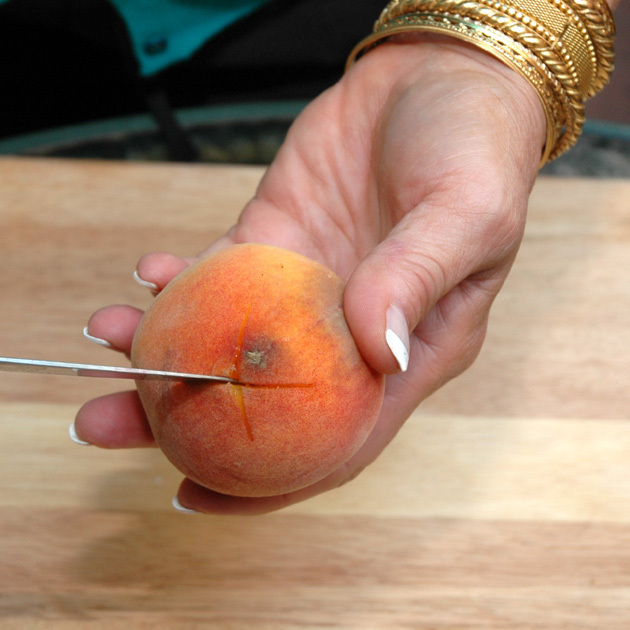 Print a copy of my Fresh Peach Pie recipe and illustrated, step-by-step How to Peel Peaches for your convenience.